Windows 7, which formerly known with codename of Blackcomb and Vienna, is the working name for the next major version of Microsoft Windows which is also the successor to Windows Vista. 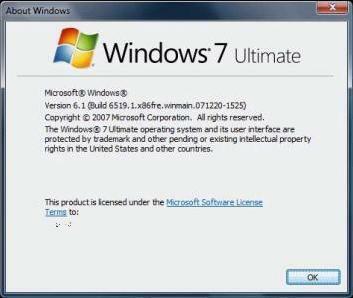 Windows 7 Milestone 1 (or Windows 7 M 1) code drop build version number 6.1.6519.1 (6519.1.071220-1525) has been released since January 2008 in both x86 and x64 versions, is now leaked for free BT (BitTorrent) torrent download. However, it’s not the Windows 7 M1 Build 6574.1 which has confirmed to be released by Microsoft. Users and operating system tech enthusiasts who eager and can’t wait to tryout Windows 7 can now download and install the very first release on Windows 7 M1. But do remember that Windows 7 is still very early in beta phase, with expected release date of 2009 or 2010, more than 2 years from now. So this download is not for the fainted heart, and do expect lots of hiccups, bugs, and errors during installation and daily use. If you just intended to see how is Windows 7 looks like, here’s screen shots and video demo of Windows 7 M1, and also video demo of multi-touch and gesture recognition in Windows 7. About Windows showing Windows 7 Beta M1 has the build version number of version 6.1 (6519.1.x86fre.winmain.071220.1525). Update: Build 7000 of leaked Windows 7 Beta 32-bit BT download and leaked Windows 7 Beta 64-bit BT download. Installing Windows 7 M1 will prompt Windows Vista edition selection. 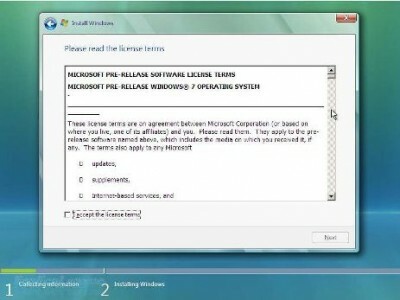 However, the EULA has been changed to reflect Windows 7. Another name for Windows 7 Beta M1 release torrent is Microsoft.Windows.7.Build.6519.M1.DVD-MSBP, which is the same copy of ISO. Note that for the installation to be successful, user must set the computer BIOS date to 2nd December 2007. No product key is needed during installation to has 30 days free evaluation activation grace period. Windows 7 requires same system requirements with Windows Vista (at least 512 MB memory). If you intend to use more than 30 days, there is a hack to crack and activate Windows 7 M1, using activation files from Windows Vista. 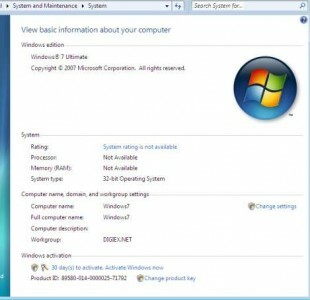 Windows 7 M3 pre-beta build version 6801 32-bit (x86 or i386) and 64-bit (x64 or amd64) have been leaked for free download.